Do we need a new map? How the referendum changed the political landscape for campaigners. For those concerned that this is becoming a blog about political theory. Fear not. Normal service will soon resume. But a skill for any campaigner is considering how the changing external context is affecting the issue that they’re campaigning on. As a result over the last few months I’ve been thinking a lot about what the uncertain and turbulent times mean for the political context we find ourselves in. For a long time we’ve considered politics to be about right and left, and tried to place our targets and audiences on that. We’ve always know it was a little simplistic – David Bull explores this some more – but it works when thinking about who to target and who we need to demonstrates supports our issue or cause. When you have a right of center government you have to consider who are the allies that you might be able to build on the right that you can engage in your coalition, or think about how you frame your message to appeal to ‘right of center’ voters. And the same happens when you have a left of center government. 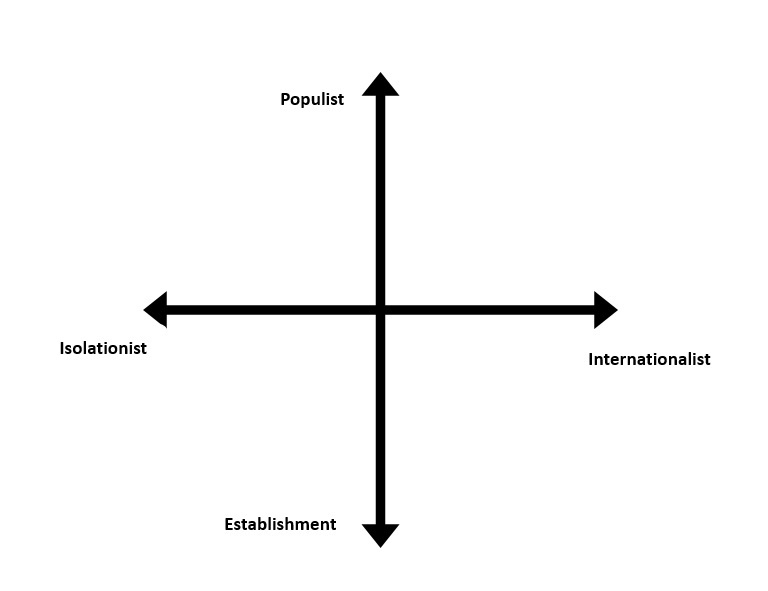 Instead of thinking about Left – Right, I’ve been thinking about needing to work from a Populist – Establishment/Internationalist – Isolationist matrix. It’s built on the premise that perhaps there are groupings across political parties that have as much in common as others within their parties – we’ve long known that there are factions within parities – but the referendum seems to highlight new alliances across parties – see the emergence of More United led by Paddy Ashdown, or the continuation of Britain Stronger In becoming Open Britain with strong cross party support. Populist or Establishment – Lots has been written about the rise of Sanders and Corbyn on the political left, or populist movements on the right across Europe and beyond – all of whom have been able to position themselves as ‘anti establishment’. While part of the reason the Remain campaign failed in the EU referendum was that it wasn’t able to shed an establishment image against the more populist message that was being pushed by Vote Leave. This axis also throws up some interesting challenges for me about how many campaigning organisations and our messages are perceived – are we seen as too much part of the ‘establishment’? Internationalist or Isolationist – this is a question about the range of policies that people want to see enacted, especially when it comes to Brexit. Internationalists are those that believe that the big challenges we face can only be solved by cooperation and collaboration across boundaries. Isolationists on the other hand believe that first and foremost it’s about solving the problems at home – it’s about ‘taking back control’ or ‘pulling up the drawbridge’ depending on your viewpoint. But if that’s about political targets. What about the public? This recent research from Social Market Foundation is well worth diving into. It suggests the public could now be grouped into eight political tribes – these aren’t going to replace the existing parties, but highlights that the political views of the public are more complex, and might shape the possible policy directions of the existing parties, as any good politician is going to think about how they can build an electoral coalition that can win. 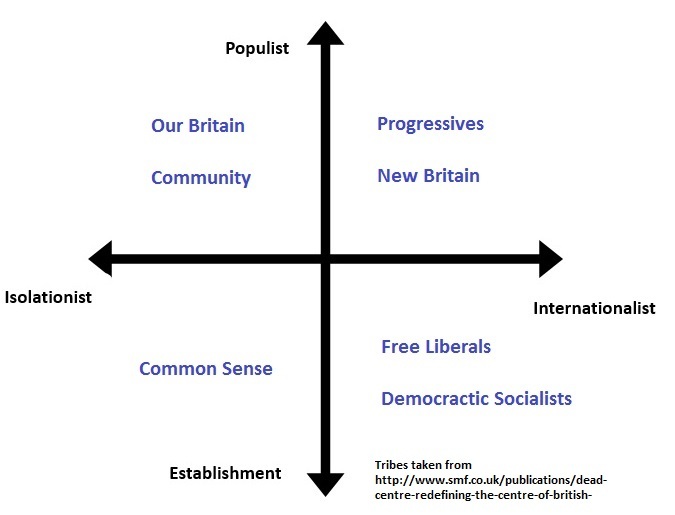 I’ve tried to place the tribes onto the Populist – Establishment/Internationalist – Isolationist matrix – which is interesting to consider – especially when you reflect on the relative sizes of the different tribes. 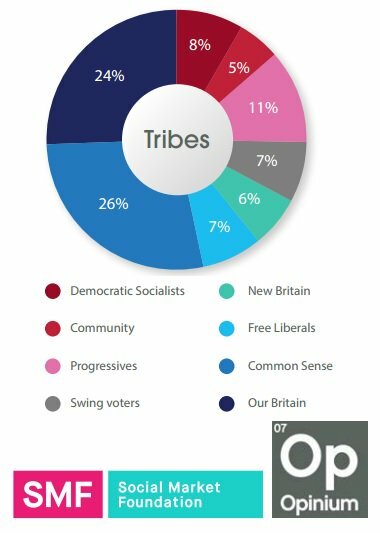 The Social Market Foundation suggest that Our Britain accounts for 24% of the population, compared to 5% for the Community tribe. I think it shows that there is possibly a clear pull towards the Populist/Isolationist side of the matrix which could presents challenges that campaigners are going to have to overcome if politicians feel the need to tack towards that group to sure up electoral support. I’m not suggesting that campaigners should adopt policies that will appeal to the Our Britain tribe, but as I’ve long argued, as campaigners we need to spend more time considering different perspectives, and understand that we often live in a bit of a ‘bubble’ so we need to become more aware of different tribes. This means finding ways our messages could resonate with other tribes, or find ways of expanding the tribes that support our calls, or at least giving the impression of more size. Right, that’s the political theory lesson over – normal service will resume next week, but I’m interested in what people think – as a passionate internationalist I’m concerned about the need for voices in the populist and internationalist box that can energize and engage.